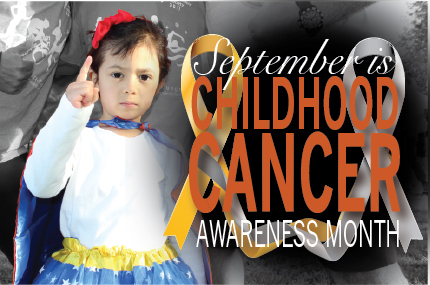 Childhood Cancer Awareness Month (#CCAM) is an annual international awareness month to raise support, funding, and awareness of pediatric cancers. It's a time to honor our most vulnerable brain tumor patients – children – and their families as they confront the challenges of living with this disease. This month, join us at a signature or community event, donate to Defeat Pediatric Brain Tumors, or connect with us on Facebook, Twitter, LinkedIn, our blog, YouTube, and Instagram to share pediatric brain tumor stories. For newly-diagnosed brain tumor patients, making decisions about treatment can feel overwhelming. The NBTS Brain Tumor Experience is an online resource that can help prepare patients and their families for their own unique approach to survive a brain tumor. 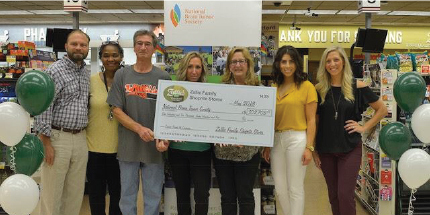 In the first week of August, ShopRite of West Deptford, NJ and Zallie Supermarkets Inc. presented a check for more than $100k to support the National Brain Tumor Society. The third annual fundraiser, generously spearheaded by the Zallie family, has raised over $250k since its creation in 2016. The Zallie's are long-time supporters of NBTS. Over the last two years, the fundraiser has increased from 8 to 11 ShopRite locations in New Jersey and Pennsylvania, and always takes place in May during Brain Tumor Awareness Month. Outside of the fundraiser each May, a number of Zallie Family Shoprite employees generously support the local Race for Hope Philadelphia. If you own a business, or are connected to a business that has the capacity to conduct an in-store change round up, we would love to hear from you! Contact Chief Development Officer, Lauren Hall at lhall@braintumor.org. This fall, join us at one of our new events and make a difference in the fight against brain tumors. From the new Northern NJ Brain Tumor Walk & Gray Mud Run, and Richmond Brain Tumor Brewhaha 5K Run & Walk, to the new Florida 5K, now is a perfect time to participate in a walk, ride, race, or freeze. Find a signature event near you. Members of Congress return to their local districts during the Congressional Recess in August. Now is the time to contact and meet with your Senators and Representatives about the needs of the brain tumor community and the importance of funding medical research. Learn how to contact your members of congress. Last year at Race for Hope Philadelphia – the second largest Brain Tumor event in the country – Teyton bravely shared his brain tumor story. This September for Childhood Cancer Awareness Month we'll be sharing more of his story, along with others across the cancer community. Watch Peyton tell his story. Advice Column, July 2018: What Should You Know About Brain Tumor Clinical Trials?